Trolley for Sit On Top. The rods rotate to be adjusted in the kayak scupper holes. Removable wheels with pins. Universal transport trolley that can be adapted to traditional and sit on top kayaks. Comes with strap. Trolley stainless steel for Sit On Top kayaks Multiple position to be adapted to all RTM Sit on tops. Easy movement thanks to its large wheels. REF: AK 9000 Kayak trolley with foldable kick stand. This trolley can carry loads up to 40kg. Suited to infla- table or rigid kayaks and light weight crafts. Standard (club trolley with tiller), can be used for yole, Yolette and skiff. Turbo model. Folding trolley with strap (which enables to transport and to store easily), easy to use. A single person can launch a boat and carry by foot easily. BEACH DOLLY ALUMINIUM DISASSEMBLED BEACH TROLLEY We only deliver to USA and France. For the rest of the world please contact your local dealer. This trolley makes getting your paddleboards to the water even easier, especially if you've got a lot of boards. It suits also for Kayaks, Windsurf & Longboard. Light aluminium frame + wide strap.Low pressure tyres. Easy to disassemble. This light‚ compact trolley is ideal for single kayaks and sit-on-tops‚ bearing a load of up to 60 kg. It has a heavy-duty marine-grade aluminium frame with removable pneumatic wheels‚ which cope with rough ground and mud. In plywood (less bulky than aluminium). Maximum load 60kg. ... with floating hatchback and it's the only adoptable system in case of reduced garage room. We can design and produce the trolleys on demand to fit the boat design. 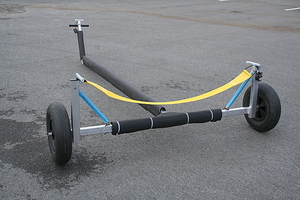 A launching trolley can be used to move a centerboarder, a jetski or a small racing catamaran across a beach or from a parking or storage area into the water. These trailers facilitate moving even the smallest of craft. Made of aluminum or PVC tubing to save weight, each model is designed for a particular type of craft. Thus, the variety is extensive. A sturdy structure will ensure durability. The choice of wheels is particularly important, especially if the trolley will be used on soft or broken ground.